My parents celebrated their 50th Anniversary this past summer. What a huge accomplishment….I am a very proud daughter!! 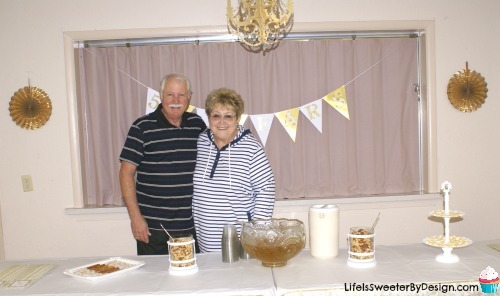 My brother and I had a 50th Anniversary Party for them and it went over amazingly well. I am going to share some of the party highlights with you!! Our parents didn't want a big fancy to-do made over them. We tried to respect their wishes, but still have a nice reception because being married for 50 years is worth celebrating. We wanted to make the party really easy for our friends and family to attend. We had it at my parent's church in the fellowship hall area. This isn't a fancy place and it is hard to decorate the space, but we did our best! The traditional color for a 50th Wedding Anniversary is gold. I considered going totally off track and doing a different main color, but went the traditional route in the end. 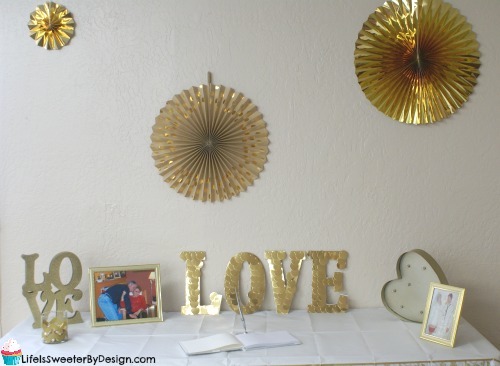 I decorated the reception in gold and white. I started looking for decor options about a year before the party. There were lots of items on clearance after Christmas. Remember..gold is a big color for Christmas too! 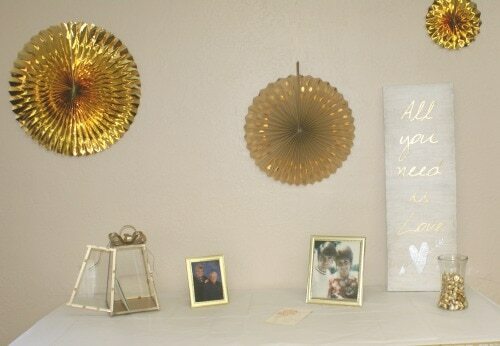 I bought items that weren't specifically for a 50th Anniversary party…but that fit the theme of gold, white and LOVE! One item that I really loved was a glass terrarium I found after Christmas that was gold. I used it as a card holder at the party and it worked great. You can see it on the table below. I bought a lot of easy to use DIY party decorations at craft stores. 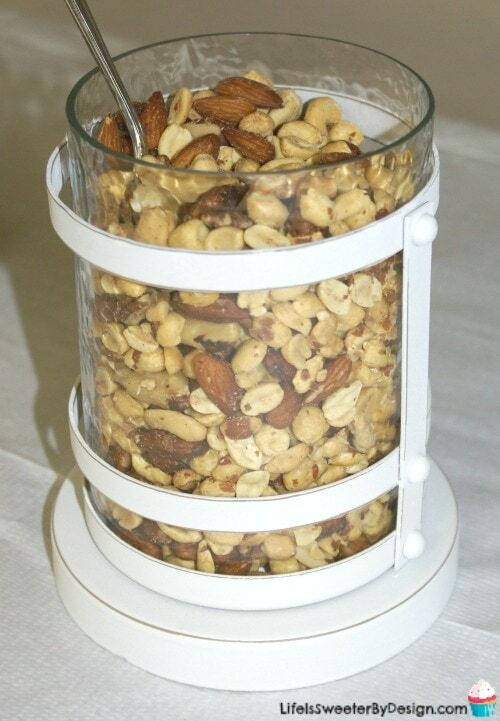 These worked well for walls and other bare spaces. I did a lot of thinking about what kind of food to have at the 50th Anniversary Party and decided to go simple. It was a good decision. We had a lot leftover and people wanted to VISIT more then they wanted to eat. 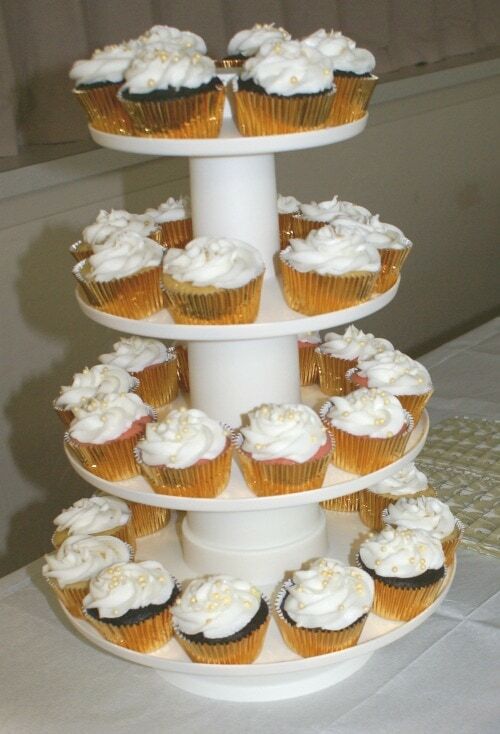 I decided to have cupcakes instead of a large cake that someone would have to stand and cut. Mingling with the guests was more important to me then cutting cake the whole time. 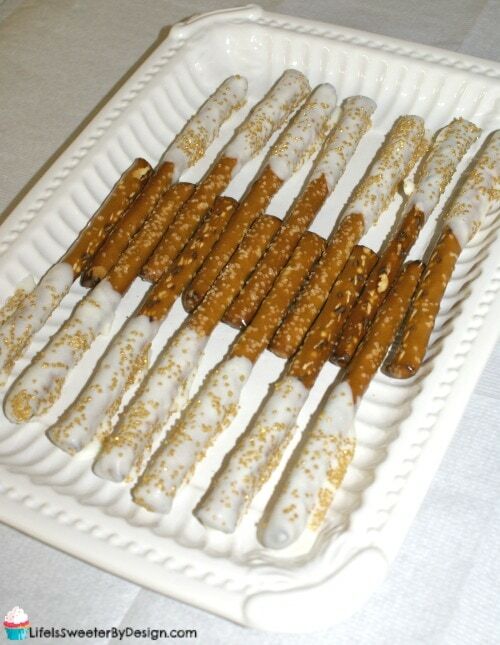 I decorated pretzels, had nuts, punch and homemade mints. 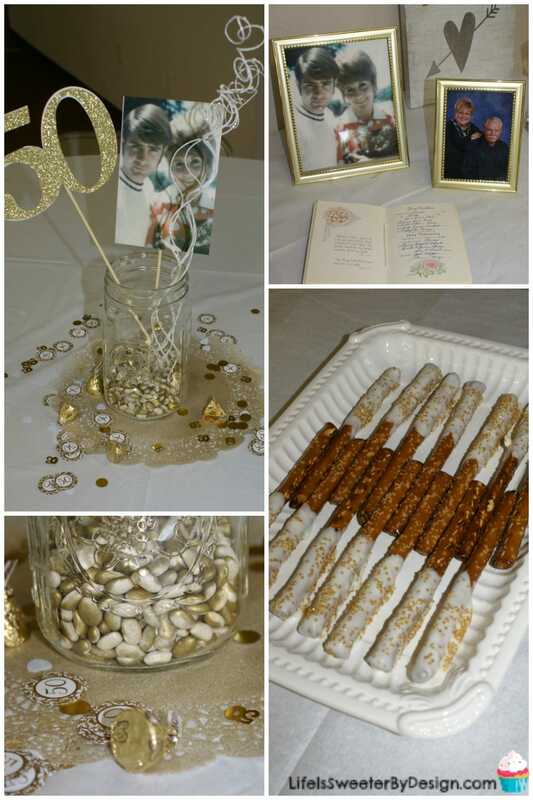 We also used gold wrapped candy in jars and on tables. I wanted to have some personalized table top decor for all of the round tables. My scrapbook cutting machine was used to cut out large 50's in cardstock. I also got copies of old pictures of my parents and attached these to wooden skewers for the centerpieces. 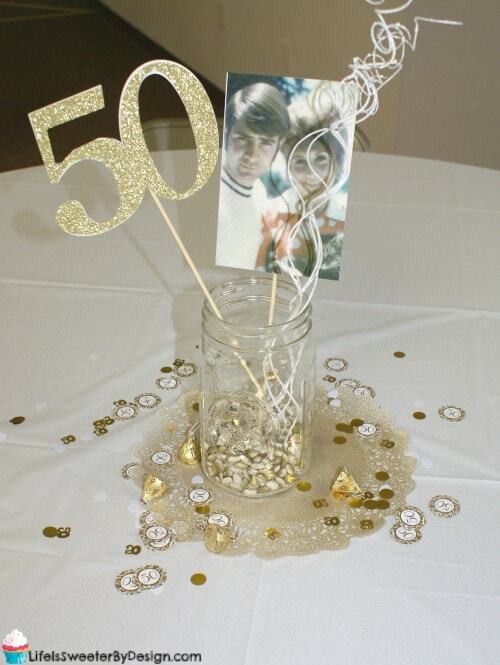 I used 50th Anniversary confetti, gold candy and gold doilies on the tables too. I alternated each table with either a gold or white tablecloth. I spent a lot of time going through old pictures and making a photo video for the party. I asked my parents for a list of their favorite songs from their dating and early married years. The video was a huge hit with my parents and the guests! I put a lot of time and love into this party for my parents. It was worth every minute. We had so many friends and relatives stop by to express their congratulations. My parents were able to visit with people they hadn't seen in years. It really was a priceless day!! 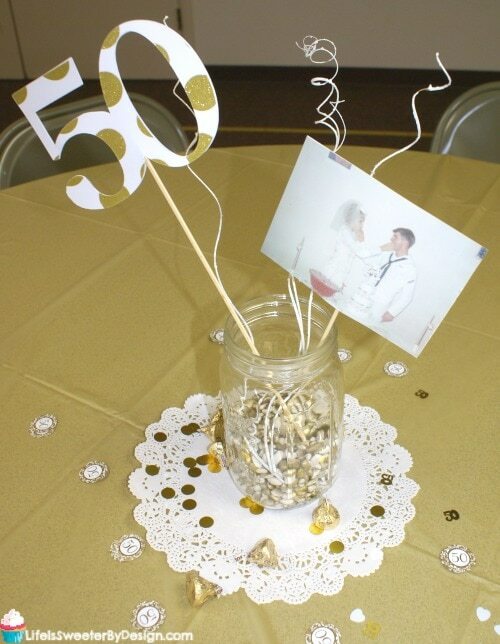 Are you planning a 50th Anniversary party for someone in your life? What kind of party do you have planned? I would love if you left me a comment about your plans!